Making new friends -in a foreign country, in situations you’re not accustomed to- is never easy. In Barcelona, it took me a month before I had the courage to have an actual, substantial conversation with any of my spanish roommates. But you just gotta do it. So, last night I went up to a random table with about 4 people at it and asked if I could join. They said yes, then continued talking in Swiss-German (I had no idea what they were speaking at the time..they informed me later), as I basically watched. Then, a girl came back from having a smoke outside and we began to chat. She was from Belgium, had just visited her boyfriend in Brazil (lucky), and was now traveling by herself for 2 months. Eventually, we adopted one of the Swiss girls into our conversation and soon, the 3 Swiss boys joined too. We had such a good time, that four hours later, around 10 pm, two of the Swiss boys asked me to go to dinner with them. I accepted, they ran to invite their Venezuelan roommate, and we headed to Gran Parrilla del Plata, a steak house on Calle de Chile, specializing in lomo asado. When we walked in, I noticed a woman waving to me from across the room. What? I don’t know anyone in this entire country! After some more squinting, I recognized her….it was my FLIGHT ATTENDANT from the plane! We hugged, and she told me to enjoy myself in BA. We sat down and Diego, my new friend from Venezuela, chose a wine for the table. When the waiter came, he asked me to try it (I’m guessing since I was the “lady” of the table), and when I gave him the “bueno,” he continued to pour for the other diners. 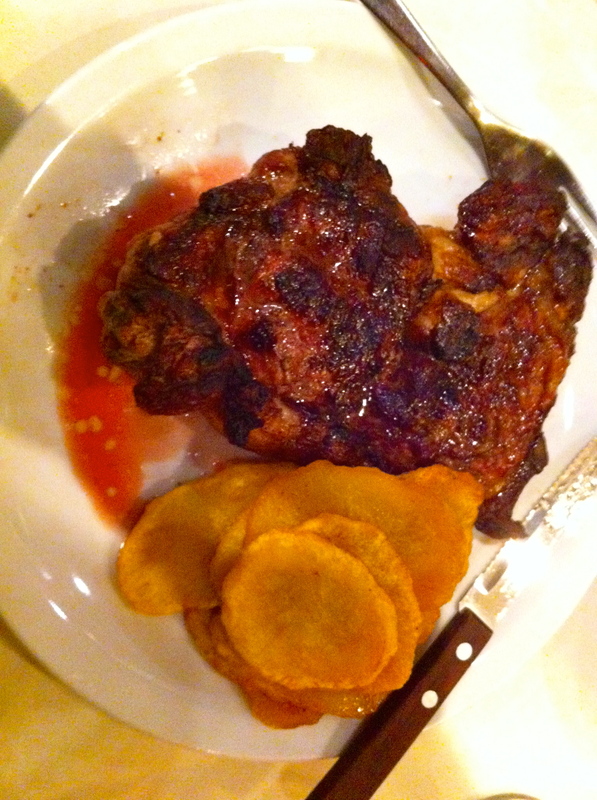 I ordered the ojo de bife, and the other three boys ordered the lomo. We decided to share patatas españolas and patatas fritas y con ajo. The food was…..ohmayygawwwdddd. SO GOOD SO GOOD SO GOOD! I cannot get over how good it was. While we were eating, Marco, one of the Swiss-Germans, told us a few stories about his travels through Asia. He just completed his masters at 24 for engineering at a Swiss University, and will be starting his doctorate in the fall. His stories about adventures in Peru, Shanghai, even Dubai, were unbelievable!!! He even had one about taking a driver’s license test in Kazakhstan. Diego has some pretty intense day-to-day adventures too. Once he heard me speak spanish to the waiter, he was more open to speak with comfortably with me. He told me he’s a journalist at a radio station in Caracas, Venezuela and at first began telling us how much he appreciated the city, despite what’s portrayed to foreigners. After a while however, he began revealing details on how intense and stressful the news was (he compared it to an internship he did in New York where he couldn’t believe how “calm the news was” -wherefore in Caracas, everyday, there is “CNN-worthy material” and “intense drama like I didn’t see in the states”). He continued on a rampage about Chávez, and how unnecessarily chaotic the country became when citizens began mourning his death. It was interesting hearing about these global news pieces from someone who has actually experienced them. 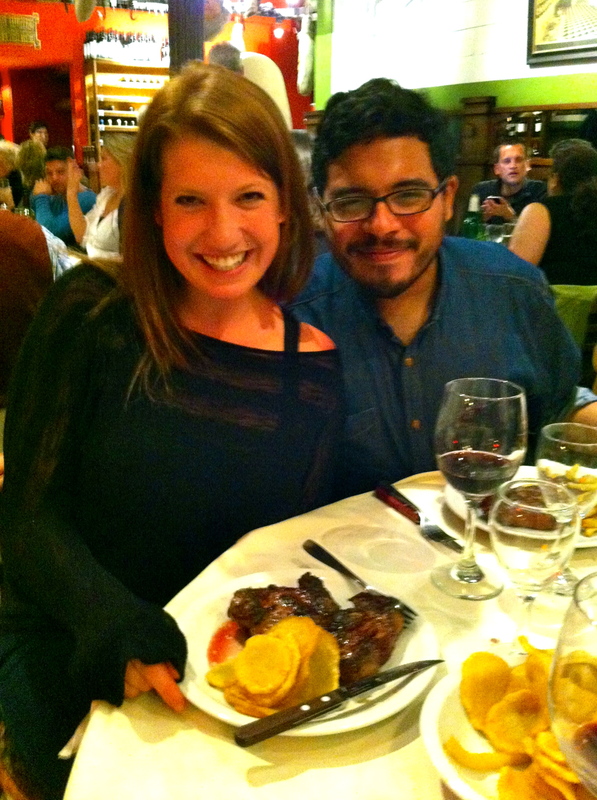 me with Diego: enjoying our ojo de bife, patatas, lomo asado, and vino tinto! Anyways, after dinner we asked for la cuenta. The waiter was surprised, as apparently we hadn’t yet received our complementary glass of champagne! So, of course, as a formality and cultural respect, we each enjoyed a complementary glass of AMAZING AMAZING AMAZING champagne, before concluding our meal. By this point I was getting nervous about how much the meal would cost –after all, we each had HUGE pieces of steak, enough patatas left over to feed a small country, more wine than I could drink, and champagne! The waiter asked if we had US dollars. “Si,” we did. He informed us that they would let us pay for our dinner using what is called the blue market rate rather than the legal conversion rate. Meaning, instead of 5 pesos to $1, it’s 8 pesos to a dollar! Amaazzinggg. So, in total, each person paid 20 US dollars (including tip) for what I can say was one of the best meals I’ve had (and ever will have) in my entire life. I love the comment about the Casa Rosada–White houses are so 1776! Ha!